I encountered a pretty interesting factoid last month: Used car sales around the world are up! Our global auto industry is pretty good at counting its own output–numbers of cars sold in each region, by country, by manufacturer, by style, by option, and a dozen other distinguishing factors. It is pretty easy to get a reasonably accurate figure on global new car production–somewhere around 60-70 millions of automobiles per year–but nobody is counting the numbers of used cars hitting the roads in developing economies. Historically, industrializing countries have been aware that a sound economy is based on good transportation policies and infrastructure as well as a vital automobile industry; many have developed tariffs and duties to favor growth of domestic automobile production and import of new cars only; the intent has been to keep foreign prices high and subsidize local production. Since the economic crash of 2009 and the consolidation of global auto manufacturing, domestic production has declined or disappeared and governments have relaxed regulations, allowing the import of used vehicles from other countries. This has resulted in a boom in availability of inexpensive, gently used vehicles entering these economies at now-affordable price points, producing an exponential expansion of vehicle ownership and its resultant traffic congestion. 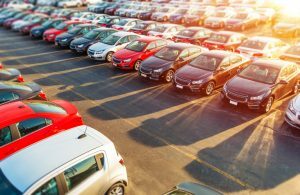 For developing economies that do not have the parking, roadway, and regulatory infrastructure to handle mass vehicle use, the growth in demand has been difficult to accommodate. In North America, some are predicting a decline in automotive infrastructure demand as autonomous vehicles come online. Modern vehicles are well made and can easily last 15 years. As our internal parking requirements decline through the next decade, perhaps our future lies in helping the developing world catch up with their infrastructure needs. David Hill, CAPP, is CEO of Clayton Hill Associates.